Rwanda in recent years is experiencing a surge in population growth. This is mainly concentrated in large towns and cities such as Kigali, its capital, which has become the center of a strong migration from a population once almost exclusively rural. Over the past 50 years its population increased a hundredfold. Environmental degradation, uncontrolled deforestation, exploitation of wetlands for residential, industrial and agricultural purposes are just some of the effects of this unplanned expansion. The project focuses on an informal neighborhood, located in the north hills of Kigali, particularly affected by these changes. On top of the hill there are newly constructed governmental and institutional buildings. Those activities attract a lot of speculative interests in the area that, by embracing the desire to “clean up” and enhance the city’s image, apply a strong pressure for change. Consequently part of the existing neighborhood has already been demolished and partially replaced by high-priced private houses. However, the area is lively and has been occupied for more than one hundred years by the informal settlement of Urukundo, whose 3400 inhabitants’ lives are strongly linked to the territory. At the bottom of the hill, the area is currently enriched by a small clay cooperative in which some or the inhabitants work. At present the services and infrastructures are fragmented and therefore impractical or unused. In addition they unevenly reach the population of the area, creating huge discrepancies between the inhabitants. The open-air gathering spaces, the playgrounds and green areas are fragmented and often not separated from the dirt roads and therefore dangerous. The vegetation is sporadic and not suitable for the containment of the soil in order to avoid fluvial erosion. Further the accessibility to some parts of the neighborhood is very problematic and the movement along the main road network is made even more difficult by the yearly erosion in the rainy season. At present the services and infrastructures are fragmented and therefore impractical or unused. In addition they unevenly reach the population of the area, creating huge discrepancies between the inhabitants. The analysis of the urban context and the governmental development programs, in addition to the survey made directly on site, were used to recognize the needs of the area and to identify the useful changes that would allow the passage from a condition of deficiency (in terms of infrastructures and services) to a condition of sufficiency. 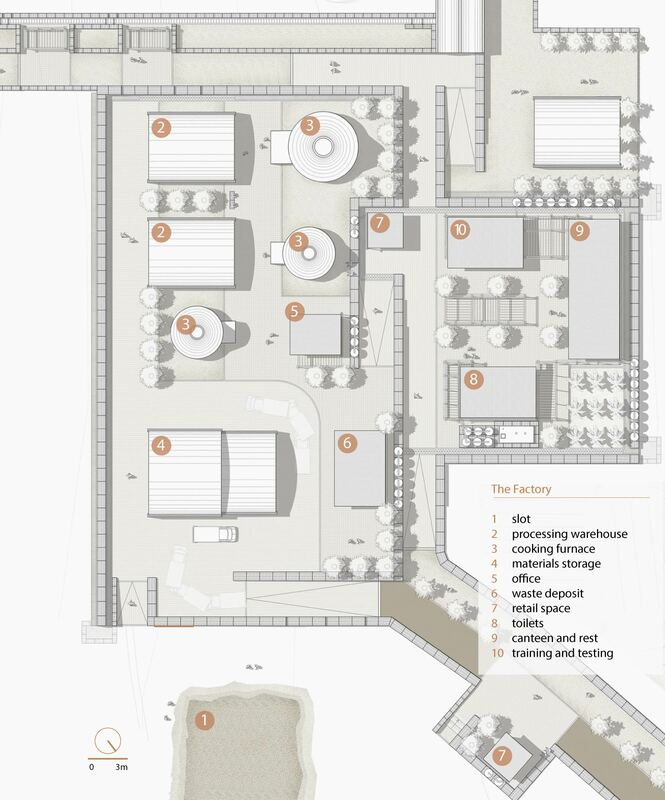 In our proposal everything started from the improvement of the existing clay cooperative by creating a small factory that would use the clay-rich soil found in the valley. Initially it would start producing the construction materials used to build the various elements of our project, in a first phase concentrating on the other parts of the factory itself (other furnaces, warehouses and annexed buildings, including a training center). In the second phase the development spreads to the settlement. We focused on the improvement of the conditions on the main road that crosses the area from the top of the hill to the valley at the bottom. Currently the road is a dirt road that is subjected to heavy erosion from rainwater run off. To prevent this phenomenon we decided to create a packed ground road, with a system of rainwater collecting canals. The canals collect the water in order to reuse it for daily activities such as irrigation and public services after going through a system of sand filtration in covered and open-air basins. The terraces, on which the basis are placed, are created with retaining walls made of metal gabions that are filled with the waste of the production of the brick factory you will see these used throughout the project for land consolidation purposes. This is a perfect example of low-tech sustainability: finding a new application for the production of normally unused waste following the ideal that nothing is left behind, but instead everything can find a new, previously not envisaged, use and purpose. An idea embraced throughout our planet’s slums where oil cans become roofs and plastic bottles are now light bulbs. …a perfect example of low-tech sustainability: finding a new application for the production of normally unused waste following the ideal that nothing is left behind, but instead everything can find a new, previously not envisaged, use and purpose. By inserting new activities and services, and concentrating them along the road in designated focal points we aimed to disperse the development throughout the settlement. The dense structure of the neighborhood requires specific interventions that create a network of infrastructure and facilities based on the logic of micro-intervention. From the central element of the clay factory to the other punctual components of the project, we aimed to work on a small scale but with an eventual much larger vision of intervention. In a third phase the lessons learnt by the local population through their involvement and participation in the construction of the buildings could, and hopefully would, then move into the construction of their own dwellings. This, combined with the newly acquired construction techniques, would lead to an evolution of design and a permanence/security for the neighborhood. The factory could also start the production of artisan products and other construction materials saleable on the market. In this way, the factory will also stimulate the development of other businesses around it. It becomes the core element in the process of creating a new income generating activity and employment whose benefits will guarantee better living conditions for the local community. 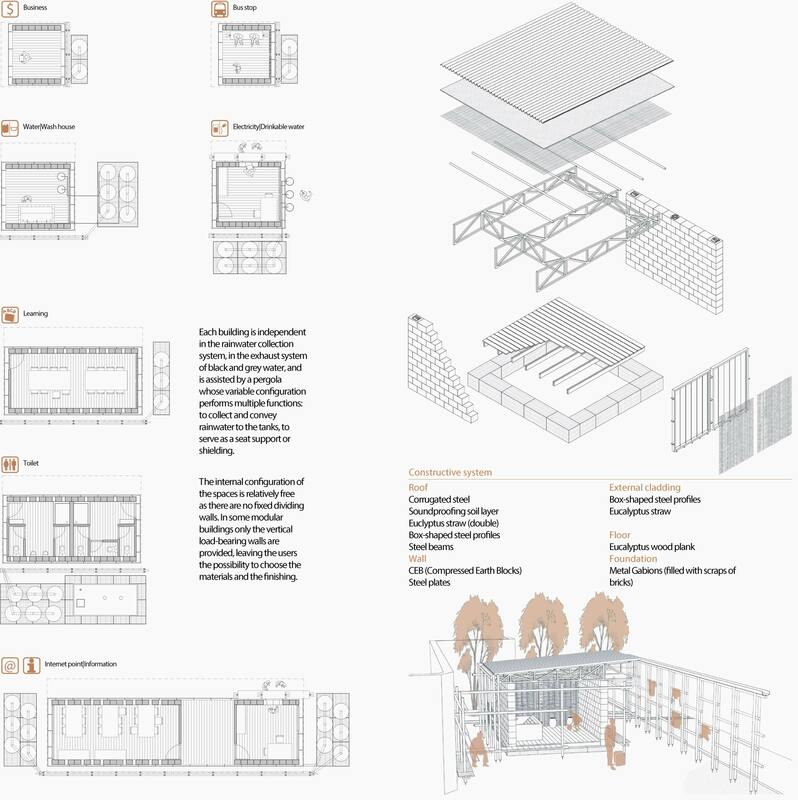 The proposed micro units or loci were designed to hold a wide range of functions, such as: laundry facilities; public wash-houses; toilets; access-points to electricity; refuse areas and waste collection systems; internet points; bus stops, after school classrooms, the cooperative’s headquarters and offices; small businesses units. Every unit works both independently and together with the others to create a network of services easily accessible by all the inhabitants. The buildings are built using low-tech technologies and low-cost local materials such as CEB (Compressed Earth Block) bricks produced in the clay factory, vegetable fibers (i.e. eucalyptus or banana tree straw) with structural elements in local timber. In each building the rainwater is collected, stored in tanks and then used for either the normal activities of the building or for the supplying of drinkable water for the local community alter being filtered in apposite portable clay filters (also produced in the clay factory). The buildings used as public toilets are connected to biogas micro-production systems (bio-digesters), held in buried tanks and located close to activities that can then use the gas such as canteens. Much attention was also placed on the open spaces, trying to improve their accessibility, creating public parks and gathering places, controlling the conveyance of rainwater and the erosion of the soil. We also approached the problem of lack of cultivated land in the area following the principal that reintroducing spaces designated for cultivation capable of sustaining the consumption of the local community is a crucial element in the redevelopment of an informal settlement. As the neighborhood is very dense and compact we identified such land on the hill on the other side of the valley, where the existing buildings have been demolished. This will be organized in communal plots on terraces. Furthermore, the technological systems adopted in the project allow an improvement of the production: one example is the biogas system that produces solid residues that are very useful as organic fertilizer. The project was born from the desire to create spaces for the people who live in the neighborhood and for the activities they perform every day. Our proposal explores possible solutions to localized problems by observing the in-habitants needs and way of life. The task we tried to follow was to preserve and enhance some aspects of their daily life, especially those common characters able to further strengthen the existing social network. The factory is to be seen as a seed that initially grows its roots through the valley tying it to the area. It then grows out into the settlements bringing flowers, which in turn seed along its branches creating off shoots, which then start to grow their own roots and spread exponentially out in other directions. Essentially a tiny initial investment self funds the redevelopment of the neighborhood and then can start to blow seeds (expertise) to other informal settlements elsewhere. From the central element of the clay factory to the other discrete components of the project, we worked on the logic of the micro-intervention that can generate a global change once its effects start to germinate. Robert Elkins is a student of life. An architect, a photographer, a bumbler and an artist. He runs a practice near Bristol in the UK.He is one of the founding members of the OC Workshop a european collective of architects volunteering their time to charities and progressive organizations. A fan of gorilla and subversive architecture, He is a passionate believer in humanity and the good it can do both collectively and on an individual macro scale. Riccardo Valsesia graduated from the IUAV University of Venice with a Masters in Sustainable Architecture. He is constantly developing his interests in everything related to the principal of sustainability, especially within developing countries. Having spent more then half of his life abroad, he’s constantly searching for the next experience. He is the co-founder of OC Workshop and his projects have been published in Italian and international architectural magazines and exhibited in venues from the US to Greece. Lucia Fanetti Zamboni graduated from the IUAV University of Venice with a Masters degree in Sustainable Architecture in 2011. At present she is collaborating with an architectural firm in Brescia – Italy – being involved in a series of national and international competitions. She is one of the founding members of the OC Workshop. Together they look to propose an architecture free from speculation. They immerse themselves in contexts trying to improve and respond to the many challenges that already exist in our world.